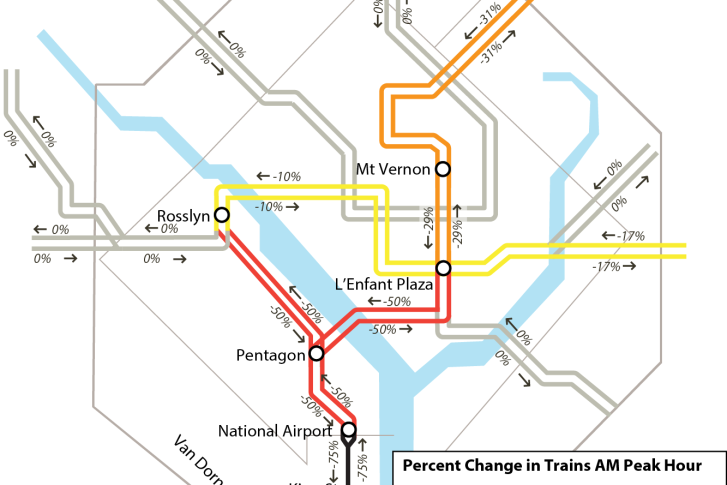 The next phase of round-the-clock track work will significantly cut Metro service south of Rosslyn and L’Enfant Plaza. Find out how to get through it and around it. UPDATE: 3/20/17 4:45 p.m.: WASHINGTON — Metro now says Blue Line riders should only expect trains “every 24-30 mins,” rather than the 24 minute gap that had been promised at all times. Last week, Metro announced it had extended the current surge schedule through the end of the day April 12. The Blue and Yellow lines are each scheduled to run every 24 minutes throughout the work zone now, rather than the previously planned restoration of Blue Line service for the first week of April, Metro spokesman Dan Stessel said. Metro cited the mid-March snowstorm as a primary driver of the schedule change, along with the frigid cold that followed. In addition, Metro said there may be complete shutdowns of the tracks south of Braddock Road on both lines beginning at 8 p.m. Friday, March 24, and Wednesday, April 12. The following surge zone between College Park and Greenbelt on the Green Line is still scheduled to begin Saturday, April 15. 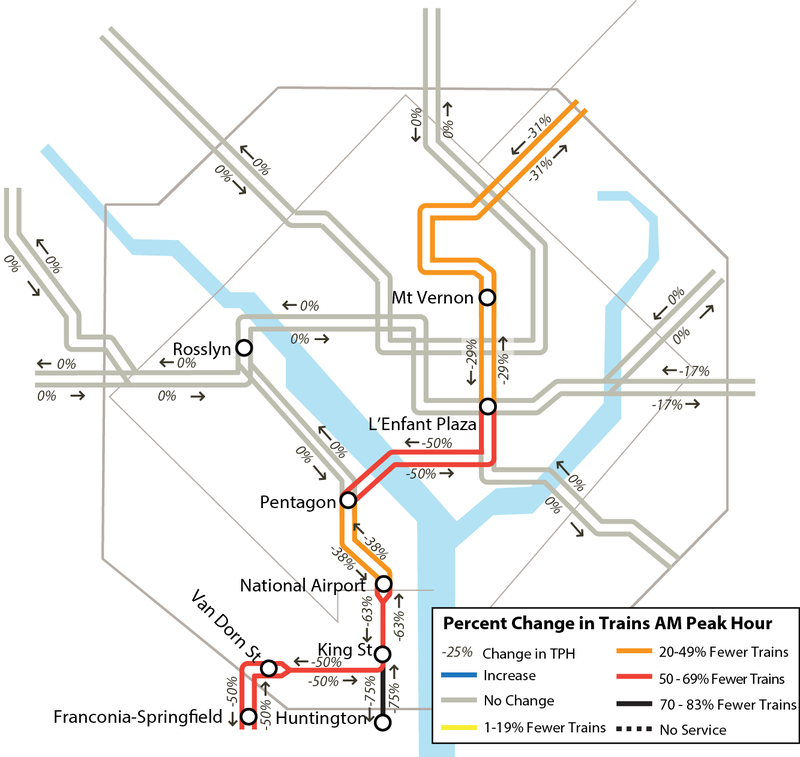 WASHINGTON — Round-the-clock track work significantly cuts Metro train service south of Rosslyn and L’Enfant Plaza through the Pentagon, Reagan National Airport, King Street, Franconia-Springfield and Huntington stations from March 4 through April 1. Blue and Yellow line trains are scheduled every 24 minutes at all times of day. There will be no Yellow Line “Rush+” trains between Franconia-Springfield and Greenbelt. Metro does plan to run a few additional Yellow Line shuttle trains during the day between Reagan National Airport and Mt. Vernon Square. Even including those trains, Metro has scheduled half as many trains at rush hour as usual on the Blue Line; half as many Yellow Line trains as usual at rush hour between Reagan National Airport and Mt. Vernon Square; and only a quarter the usual trains at rush hour to and from Franconia-Springfield, Huntington and King Street. Riders who typically use the Blue or Yellow lines to get to the Pentagon or downtown D.C. should consider other options, such as Virginia Railway Express, commuter and regular buses, or the limited free rush-hour shuttle buses Metro is adding between Franconia-Springfield and the Pentagon from 6–9:30 a.m. and 3–7 p.m.
Metro is also increasing bus service on the 10A route, which connects Huntington to Braddock Road, Del Ray and the Pentagon; the 11Y route between Mount Vernon and Potomac Park near the State Department; and the Metroway bus rapid transit line between the Braddock Road Metro and Pentagon City. Other Metrobus routes that could provide alternatives include the 7Y between Shirlington, the Pentagon and Farragut Square; the 10B between Braddock Road and Ballston; the 10E between Huntington and the Pentagon; the 16X limited-stop service along Columbia Pike in Arlington to the Pentagon and spots in D.C. like Federal Triangle; the 25B between Van Dorn Street and Ballston; the 28A between the King Street Metro, West Falls Church and Tysons Corner; and the 29K or 29N between Vienna and George Mason University and the King Street Metro. In Arlington, ART 42, between Ballston and Pentagon on weekdays and between Ballston and Pentagon City on weekends, along with ART 43, connecting Courthouse, Rosslyn and Crystal City, provide alternatives to waiting for what are expected to be packed Blue Line trains at Rosslyn. In Alexandria, in addition to Metroway, DASH routes AT3 and AT4 connect Braddock Road to the Pentagon, and the DASH AT7 provides an alternative between the King Street Metro, Eisenhower Avenue and Van Dorn Street. DASH is also offering a free express rush-hour shuttle bus between the King Street Metro and Pentagon. The buses are scheduled to run in both directions at rush hour every 12 to 15 minutes. From Fairfax County, Fairfax Connector Route 394 is scheduled to have enhanced express service between the free Saratoga Park-and-Ride and the Pentagon. The county also suggests VRE, Orange Line parking lots or other park-and-rides as options. VRE Fredericksburg Line trains serve Franconia-Springfield, Alexandria (next to the King Street Metro), Crystal City, L’Enfant Plaza and Union Station. Manassas Line trains stop at Burke Centre, Alexandria, Crystal City, L’Enfant Plaza and Union Station. Biking around the crowds is another option, since the affected area has a number of trails. Fairfax County has published maps of the bike routes from the Eisenhower Avenue Metro area north to Braddock Road, Braddock Road to Pentagon City, and from the Huntington Metro through Alexandria to reach the trail to D.C.
Additional bike trails connect D.C. and Rosslyn to the Pentagon, Crystal City and Reagan National Airport. From Prince William County, PRTC’s Prince William Metro Direct route will shift the final trips of the night 15 minutes later than usual, and the 7:45 p.m. weekday trip will leave Franconia-Springfield at 7:55 p.m. during the work zone. A Saturday trip that usually ends at Franconia-Springfield at 9 a.m. will instead run from there to the PRTC Transit Center. PRTC suggests its commuter buses to the Pentagon, Crystal City, the Mark Center or Ballston as potential alternatives during the surge for people who typically take the bus or drive to Huntington or Franconia-Springfield. That includes a midday trip between Dale City and D.C. from the Route 123/I-95 Commuter lot. Metro General Manager Paul Wiedefeld announced Mar. 1 that the next round-the-clock work zone on the Green Line between Greenbelt and College Park will run from Saturday April 15 to Tuesday May 16. That will be followed by a disruptive Orange Line work zone in May and June scheduled to include a very long single-tracking zone between Minnesota Avenue and New Carrollton.